As part of my blog I am adding edited excerpts of stories I wrote on/of past travels. This trip occurred several months before I started my first Internet account, so few if any of even my friends and family know of this story. I wrote part of this story on a few pieces of paper, which I happened to come across while unpacking my belongings in Shanghai! I will supplement with bits from my most-likely-faulty memories. She heard “Bangladesh” and phoned me a week later to confirm she had reserved my ticket. It hit me. I am going to Bangladesh. What in the world am I going to do there? My destination of “choice” was met by mixed reactions with those I shared the news. My supervisor laughed and asked “Why do you always go to dirty places?” The Vice Principal laughed and waited for the punch line. Another teacher nervously told me I just should not go. Another asked if it were too late for me to cancel? The more people appeared to try to dissuade me to go, the more determined I became to have myself a fantastic time . Doing what, I was not sure, but I was going to have a grand time doing it in Bangladesh! The first time through the Lonely Planet guidebook still left me wondering. It was a slim volume and easily half of it seemed to be taken up by the “Dangers and Annoyances” chapter. The things that stuck most in my mind were the deadly floods, cyclones, tigers, snakes, crocodiles and diseases. The second time through though I realized one week was not nearly enough time to scratch the surface of the country. Bangladesh is hardly a tourist destination. The country has roughly the amount of tourists in a year that Thailand receives in an average week. 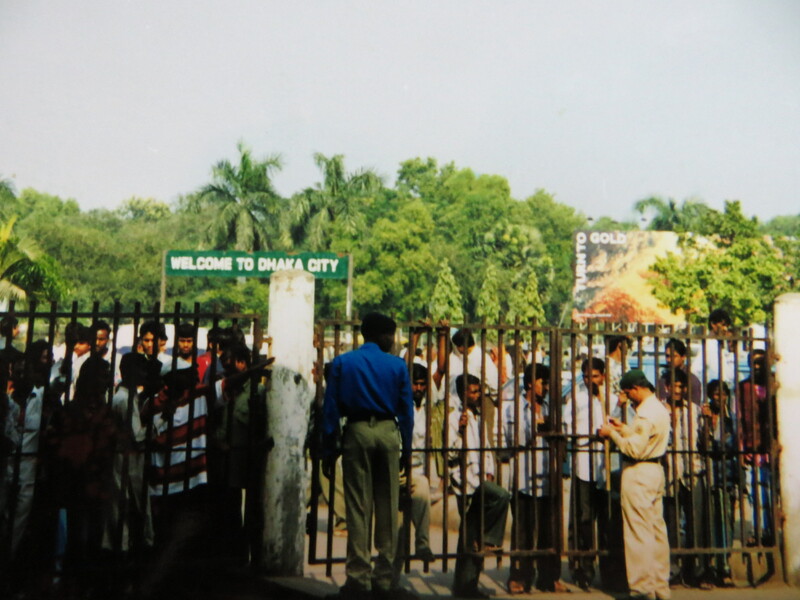 The former tourism slogan was “See Bangladesh before the Tourists Do.” The country is one-fifth the size of Japan with approximately the same population. It has the highest population density of any country, with the exception of a few small city states. (and remains so today). Crisscrossing the country are three major rivers, the Padma (Ganges), the Jamuna, and the Meghna, which divide the country into four parts. Every year the heavy rains and the melting snow from the Himalayas inundate the rivers until they overflow their banks, making many places resemble a messy Asian Venice. The country however also boasts the longest beach in the world, “shark-free” to boot (how they manage to keep the sharks away, I am not sure); and about two-thirds of the Sundarbans, the largest mangrove forest in the world and home to the last Royal Bengal Tigers, is located in Bangladesh. There are cooler hill areas dotted with tea plantations, the most famous being in Syllet. Around the country there are numerous sites of Hindu, Muslim, and Buddhist ruins as well as the crumbling rajbaris, the elegant homes of former British rulers. Bangladesh has a lot to offer. Unfortunately, I barely made it out of Dhaka. Having flown a very early morning flight out of Osaka, with a five hour layover in Bangkok, I did not arrive bright-eyed and bushy-tailed as originally intended. My first good view of Bangladesh was Zia International Airport, all four gates, with a fifth a crumbling mess of concrete and steel. I could not tell if it was being knocked down or put up. Then I was robbed at immigration when informed my visa would cost US$45 instead of the US$21 I had expected. (The Chinese tourists in front of me paid US$10 each). I dislike arriving in a new country late in the afternoon. The crush of people waiting outside the arrivals area was both exciting and intimidating. The taxi driver insisted I could not stay in a hostel in Dhaka, they are only for men. I had read much the same, and at dusk I am too tired to argue. He insists he will take me to a nice place. His brother’s place. Or the place owned by a friend of his brother. Or just a place of a guy he knows he calls his “brother.” I am not sure. I give in. He drives me to the nicer part of town, to a multi-story home converted to a guesthouse, gated and with an armed guard. Maybe this is better than a hostel… It is nice to have my own room and even a television to watch all the best Bengali programming. 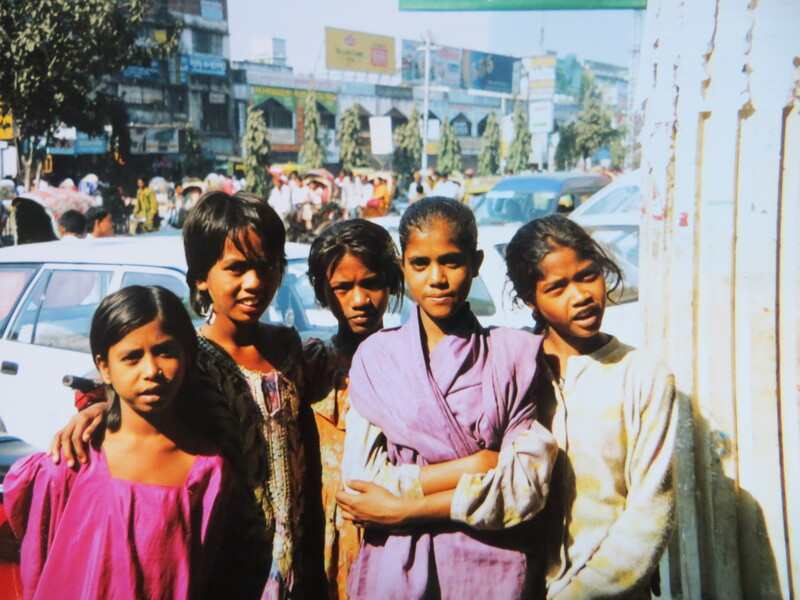 Welcome to Dhaka indeed. Almost makes you want to just stay in the airport. Much of the rest of my trip I remember in bits and pieces. What I remember most is it was Ramadan. At least in December the days were mild and the evenings cool. Yet in a country with such a high poverty rate, it felt particularly brutal to have no food or drink all day. I was not fasting of course, but I felt very subconscious when eating. I went to a local fast food chain called Wimpy for lunch and I was the only person in the restaurant. I felt strange even ordering given the staff were likely fasting as well. One evening I shared the breaking of fast meal with the owners of the guesthouse. I saw a main part of the meal included puffed rice, like Rice Krispies. So another evening I waited around the market until it was dusk, the time to break fast, and bought a large bag (a several gallon sized bag) of puffed rice to give to a group of hungry kids. I thought it would be a nice gesture, but it turned into a feeding frenzy with children and adults grabbing the bag and pulling until it burst and much of the rice fell on the ground. Still, people were scooping it up off the dirt road. Instead of feeling good, I felt horrible. One small, hopeful boy followed me all the way back to the guesthouse, where I gave him some coins for his trouble. My heart hurt. One day I decided to try to have lunch at the American Club so I would not be sitting alone in an empty restaurant feeling shameful. I had a bicycle rickshaw drop me off at the gate. I recall it being blue, but cannot be sure. There was a small sliding opening in the solid gate, which made me think of the main gate to the Emerald City in the Wizard of Oz. I must have knocked or rung a doorbell as a woman came to open the slit and asked me what I wanted. “I just want to have lunch”. Much to my surprise I was told no. I said, “But I’m an American,” and showed her my passport. The woman told me, “I can bring you a menu and you can order off of it and take it to eat elsewhere, but you cannot eat here.” So much for my first experience at the American Club. I will never forget being turned away. Another day, returning from a tour along a busy, dusty road into Dhaka, I noted at a stop that there were no sellers in the road. At first I thought this so strange. Every other developing country I had been had roadside sellers who wander through traffic selling gum, snacks, water, single cigarettes, and the like. Then I remembered it was Ramadan. It was then that I could swear I saw the dead body of a woman lying by the side of the road, her bright sari wrapped around her very thin body. People walked around her as if she were not there. We drove on. 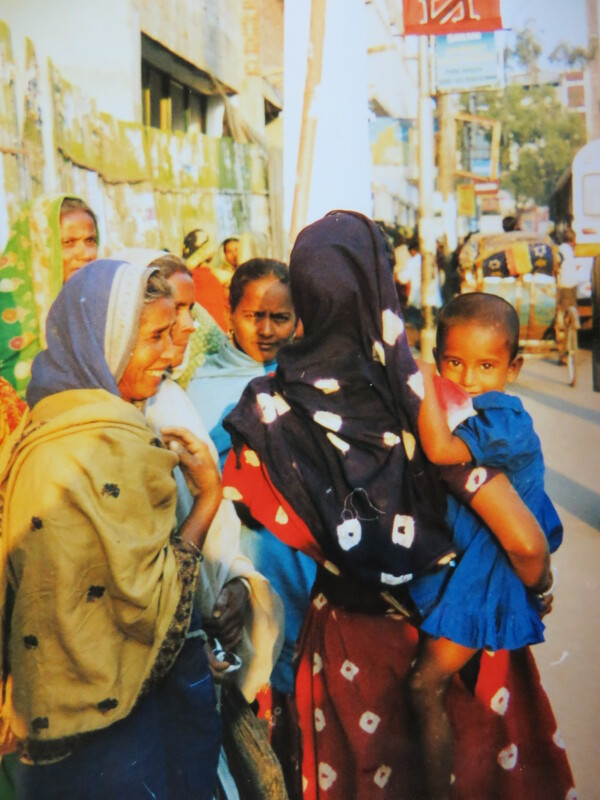 I recall I wanted to get out and see a market to buy something “Bangladeshi.” The guesthouse owner flagged down and spoke firmly with a passing auto-rickshaw driver. The owner assured me this driver knew where we were going. About 30 minutes later, it was clear to me that the driver had NO IDEA where we were going. He had driven onto a very narrow road, which barely fit two auto rickshaws side by side. He could speak no English and I no Bengali. I hopelessly blah-blah-blahed the name of the market to to him as he stared at me blankly. Suddenly, a young man approached us, a university student, who spoke English. He spoke with both of us and we were soon on our way to the market. Once there the driver apparently wanted more money than had been initially agreed upon at the guesthouse (where the owner had counseled me to pay a certain amount and NO MORE). I tried to give him the agreed upon price and he refused. He shouted and gestured at me. I blah-blah-blahed back. I put the money on the driver’s seat as he would not take it from my hands. He kept yelling at me as I started to back away. 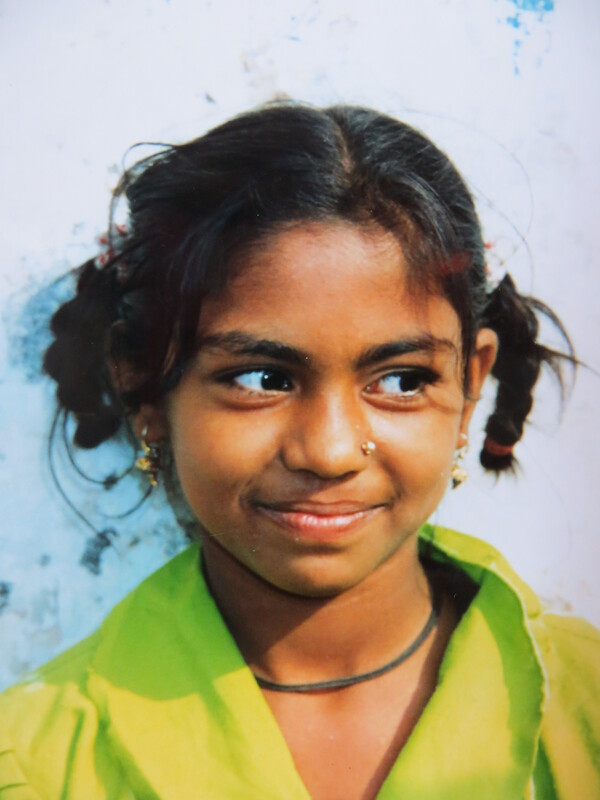 A group of five girls swept up to the vehicle, chattering in broken English, “Miss, Miss, you shopping?” and whisked me away with them. The market was a wash as there were no Bangladeshi handicrafts to speak of and the stall the girls took me to was full of t-shirts sporting Titanic and Michael Jordan themes. But I remember the girls. My rescuers at the market. 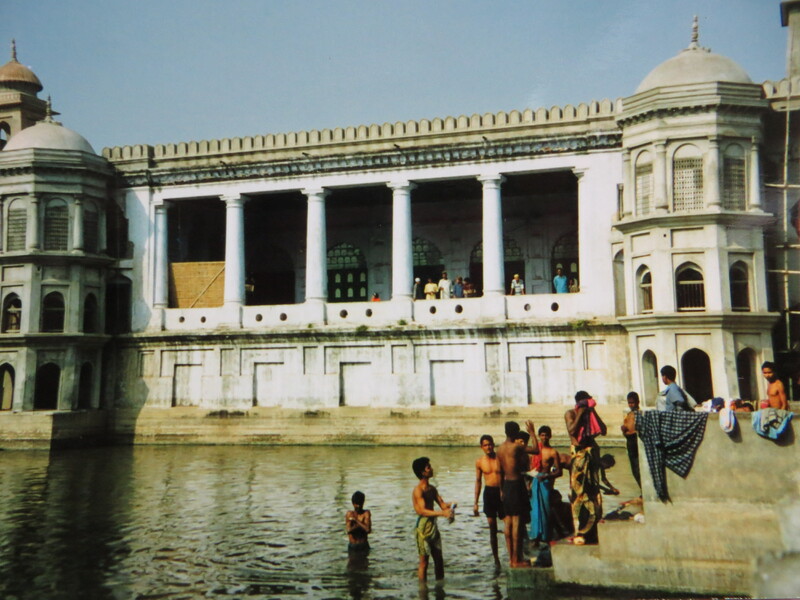 In Dhaka I visited a beautiful old mosque surrounded by a large bathing pool. The only visitors to this mosque, besides me, were men. Walking down the street to the mosque I was surrounded by a shuffling circle of men. They kept a respectful distance from me; the circle started three to four feet out from me, but moved as I moved. I also visited Ahsan Manzil, a former palace and now the National Museum. Though I do remember there were informative English displays inside, it was sitting out on the grass by the banks of the river and chatting with a local family that really sticks in my mind. At the beautiful Lalbagh fort, which made me think of the Taj Mahal (before I visited the real thing), I remember the incredibly beautiful saris of the strolling women and being stalked by a University student “practicing English,” who insisted that at my age I should be married and that he just might be the right guy for me. I searched everywhere for what I think was the Baldha Garden, listed in my guide as a beautiful, hidden must see gem. After probably an hour with an auto rickshaw, and about to give up, I finally located it, only to be rather disappointed. The buildings around the park had built up roughshod above the walls, with laundry and other detritus of life hanging unsightly through the trees. A film of dust lay on all the plants, muting the green. Young Bangladeshi couples giggled amongst the foliage and a mongoose scampered along the path. The mongoose though was worth the trip. Cleansing outside a beautiful mosque somewhere in Dhaka. 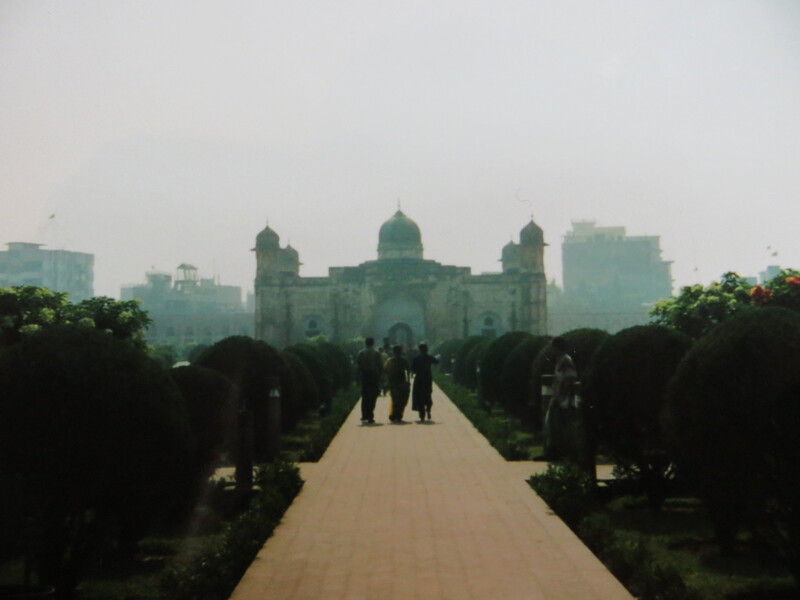 To get outside of Dhaka I found a travel group to take me on three trips: Sonargaon, the medieval capital of Eastern Bengal, a tour upriver to see jute production and a former Zamindar’s palace now a university, and also a half day river cruise on the Padma. 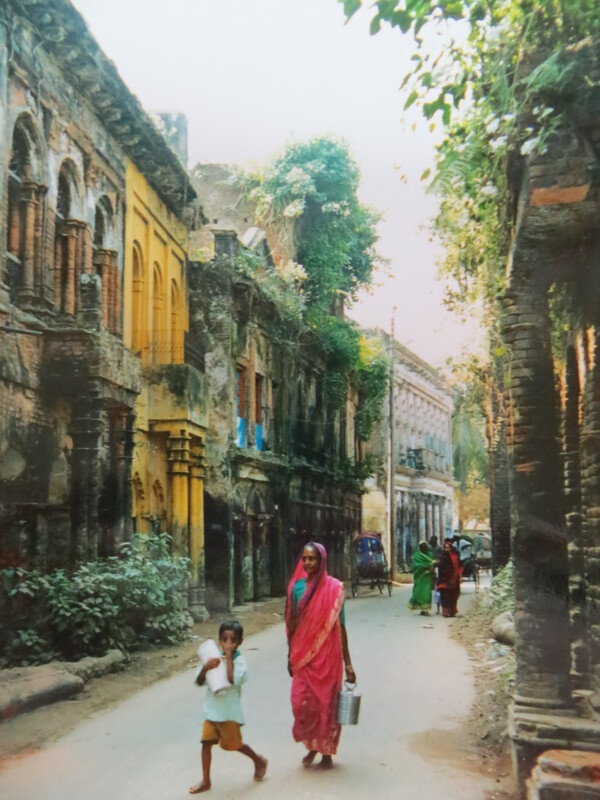 Though the buildings of Sonargaon were crumbling, which did make me feel melancholy because such a cultural and historic place should be preserved and cherished, I remember the colors so vibrantly and how good it felt to get out of the capital. The university at Murapara did not much impress me, though I liked the goats I found wandering across the campus. Far more interesting was the tour of the jute mill. Bangladesh is the world’s second largest producer of jute, a vegetable fiber, which, like cotton and hemp, can be spun and woven, and in the 19th century, many British made their fortunes as jute barons in Bengal. On the Padma river cruise I remember most that my travel companions were a Foreign Service family, husband, wife, and young son and that we did get to see two of the Gangetic pink river dolphins. Bangladesh was an unexpected vacation, yet it lingers in my mind as one that delivered more than anticipated. There were some clear hardships for most of the local people that were impossible to ignore and which made my heart ache, and yet the vast majority of the people I came across greeted me with kindness and brilliant smiles. I would like to visit again and see more of the country. Kucing and Tikus (“Cat” and “Mouse” in Indonesian), my two cats, have at last joined us at our apartment in Shanghai. They are diplo-pets, about to start life in their fourth country of residence. Getting them here to China has been a bit challenging, a story of logistics and miscommunication, incarceration in the quarantine facility and finally freedom. It is never really easy to uproot yourself again and again and it is not any easier to do this with pets, but this trip really about did me in. Indonesia to the U.S. was the cats’ first international trip. It was no cake walk, but once I found the pet shipper (the fantastically named Groovy Pets) and paid them a load of money, it did not turn out to be so bad. I had to fly over the Pacific using United Airlines, per the Fly America Act, but there was something tricky about them joining me, so I booked them on KLM cargo. They also flew out a few days before I did so as to arrive on a Thursday afternoon when quarantine facilities at Dulles Airport would be open. My aunt picked them up at the airport and they seemed in very good spirits, the KLM cargo person cooing at them affectionately. They also had a layover in Amsterdam, so I expect their flight was a sight better than mine. It cost $400 for the two of them to fly cargo and another $800 in charges to Groovy Pets. When I asked for an itemization of this fee I initially received pushback. But after I pointed out a taxi to the airport and departure fees could hardly cost so much I was informed that some of this would amount to “gifts” to various officials. Oh, I said, you mean bribes. The woman pursed her lips and responded evenly, we prefer to call them gifts. I let it go. To and from Mexico proved to be an even easier proposition. K and T only needed updated rabies vaccinations. I had all the documentation on the seat next to me in case Mexican immigration authorities stopped us, but no one did. Returning to the US we also encountered no problems. China however has strict pet importation regulations and a “one pet per passport holder” policy. (Sounds reminiscent of the One Child Policy, right?). Pet import rules also vary by city, and unfortunately Shanghai’s is a littler stricter than some others, including a minimum one week quarantine at a Chinese facility at $320 per pet. I did not like it, but I was prepared to do it. Three weeks from departure I sent an email to the Consulate to check again on the requirements and that is when I learned – oops, sorry, it turns out it is one pet per ADULT passport holder. Basically I was being told that I would have to leave one of my cats behind. I could not believe it. I replied asking if there were anything that could be done. The reply was, no, our hands are tied. I put up a status on my Facebook and a Facebook group I belong to and I had some pretty great responses – from people (complete strangers) willing to watch my cat for a few months until I returned in May on vacation (with a plan to try to import the second at another time) to several friends offering to foster my cat for the entire two years if necessary. I was heartbroken and yet really, really touched. The next day however I had another email from the Consulate informing me that one of the locally employed staff (a Chinese employee of the Consulate) had taken it upon themselves to call the section chief of the Pudong International Airport Quarantine Office, and according to him, the section chief, it would be no problem to bring in a one pet on a minor’s passport. However, the Consulate contact informed me, this was no guarantee. I emailed back: I am bringing both cats. Not that the idea the information could be wrong did not worry me. It sure did. But I had a lot on my plate right then – from my Chinese test to packing out to my mom’s health – so I decided to take a leap of faith and hope it all worked out. I booked both cats as in-cabin pets on United (the primary reason I chose to take United Airlines vice the contract carrier American is due to United’s more pet friendly policies). This was far less expensive than flying the cats as checked luggage or cargo. Less than a week before departure I took both cats to the vet. It is a requirement for most places that rabies shots are no more than one year from importation and no less than 30 days (I had taken care of that the month before). Another requirement is that a vet must issue an international health certification no more than 10 days before importation. That certificate must then be endorsed by a USDA Animal and Plant Health Inspection Service (APHIS) veterinarian. The closest USDA-APHIS Service Center to Washington, DC is in Richmond, Virginia. Yeah, that is the closest. Because that makes sense, right? Instead of chancing a round-trip FedEx, waiting and hoping it would arrive back before the flight, I decided to make the four hour round trip to have it signed. It literally took five minutes. I mean I put my car into 30 minute parking across the street, waiting impatiently in the security line to get into the building, hoofed it up to the 7th floor, had it signed, and returned to my car with minutes to spare. A crazy trip, but I had APHIS Form 7100 signed. I am lucky my sister works for TSA since I had to travel without my mother unexpectedly. I did not know how I would carry two cats through security – since you need to take each cat out of their carrier, put the carrier through the x-ray machine and then carry the animal through. I called the Dulles Airport customer service line to see if any of the volunteers could help me – but while they could help me get to security, they could not help me through. My sister however, with her super TSA badge, could. On the plane I tried not to concern myself with what may or may not happen upon landing. My immediate concerns were making sure they were comfortable and did not meow the entire flight and how in the world I would get them from the plane to quarantine after picking up our four suitcases at baggage claim. The plane landed at a gate located approximately 10 miles from baggage claim. OK, that may not be true, but when you are jet lagged and herding a jet lagged toddler and all the crap I listed above, then it does not take much to feel far. I would like to thank all the people who offered us no assistance. Because that would be everybody. I get it, no one made me bring all that stuff, you have your own place to be, still… But despite jet lag C was a trooper and she walked the whole distance. And although it was not 10 miles, it could easily have been one or more. Thankfully about half way there were some small luggage carts, which did help things along, until we arrived at the elevators. Carts could not be taken down the elevators to the immigration hall. At that floor there was a crush of people exiting from all planes to enter a single gate funneling us to multiple immigration lines. This was bordering on “every woman for herself” territory. There was not deliberate pushing or shoving but it was such a steady mass of people that for the first time I felt concerned I would lose C in the crowd. Again, no one helped. They stared, but did not help. But I saw the luggage carts. They were tiny. There was no way for me to get our four large suitcases, my carry on, and the two cats on one and how was I to push two carts and keep track of C? This is when Quarantine Lady showed up. I knew she was quarantine lady because she wore a white lab coat. And she asked if I had some pets. Foiled! But Quarantine Lady was super helpful, pushing my second luggage cart, not only to the quarantine office but also then out to the arrivals area where thankfully my sponsor was waiting. (Quarantine Lady also spotted my name first on my sponsor’s card.) She spoke English and she and her staff seemed very professional, which did put my mind at ease some. The only issue related to C being a minor is that the quarantine officials gently insisted she sign her own form, so I put her on my lap, the pen in her hand, and guided her to write her name. Done. C took our leaving the cats much better than I expected (no tears, no questioning my assertion that they were going to see the cat doctor) and, I think, better than I did. Leaving the office without the cats made me anxious. For the first few days I did not worry; I had enough else on my mind getting over jet lag, stocking the fridge, and hiring a nanny. But by the fourth evening I woke in the middle of the night from a nightmare involving the cats and quarantine. A week after we handed Kucing and Tikus over to the quarantine officials at Pudong Airport (almost to the hour) I find myself standing outside the main building of the Shanghai Animal and Plant Quarantine Station. I was not allowed to see where the cats were kept, but instead was directed to the main building where I presented our passports and paperwork, then signed a paper. The woman then made a phone call. We stood together on the road leading into the facility. The pollution levels are very high and the haze thick, limiting visibility. Out of the haze a man approaches, slowly riding a bicycle with a two wheeled metal trailer. I can just make out in the bed of the trailer the tops of the cat cages and hear some soft meowing. The man stops in front of me and the woman directs me, in English, to check these are my cats and they are ok. I feel a giddy nervousness overcome me and I look into each carrier. My diplo-cats back with me = Priceless. We have arrived in Shanghai. Well, C, the two cats and myself are here. My mom did not make it. The Friday afternoon before our departure, my mom headed to the emergency room with terrible abdominal pain. Though discharged some five hours later, the question of whether or not she would be able to fly with us on Tuesday was up in the air. Obviously this meant she would not be flying with me the following morning. This also meant that our travel to and arrival in China was going to be a very different scenario than I had planned. I had already been emailing contacts at the Consulate over the weekend to apprise them of the situation and the possibility my mom would not be joining us, i.e. my child care situation had become a bit more urgent. Child care had already been on my mind even with my mom joining us. It cannot be otherwise when you are a single parent. With our arrival timed three weeks before the Chinese New Year when many (most?) workers depart the city to visit family, interviewing and hiring a nanny in that time frame already presented some challenges. Now I would have days and not weeks to find someone. I notified the Consulate I would need to take at least Thursday and Friday off in order to find child care. A friend already in Shanghai messaged me to let me know, if needed, she could pitch in to help. An A-100 colleague offered to see if her nanny would be willing to watch my C for a week or two until I found someone and my social sponsor and his wife sprang to action, contacting all they knew for nanny recommendations. Meanwhile, my most immediate issue was getting myself, C, the cats, and our luggage from our hotel to the airport, then from the car to the check in counter, and then through security to the plane. I thought I would just take the hotel airport shuttle except unfortunately it did not start service until 6:30 am; my plan was to depart at 5:15 am. Departure was further complicated by the impending snow storm expected to hit the northeast. Although the snow was not supposed to be too bad in the Mid-Atlantic, there could be no guarantee that flights would not be disrupted. At 4:10 I woke up and began to drag the suitcases from the room, through the snow, to the car. Then I cleared off the car. My brother drove my father over at 5:15 am and we headed to the airport. My sister, who just so happens to be a TSA agent at Dulles, met us at the curb with two luggage carts and whisked the cats and some luggage inside while I took care of C and the rest of the luggage. As my sister has airport privileges, she accompanied us through security to the gate. There she had to leave us and I had to struggle to get us all onto the plane (C refused to even carry her little backpack), but we made it. A family effort. But I managed. Sure, I got a lot of looks, some sympathetic, some “I’m so glad I am not you,” some “I don’t want to be anywhere near the disaster that must be your life;” the last to which I wanted to scream “I am a U.S. diplomat you fool!” Though that response would be neither diplomatic nor shed a particularly awesome light on the Foreign Service and so I, in actually an incredibly diplomatic manner, chose to let those people believe what they would and carry on. You know, as best one could carry on with a cat carrier slung on each shoulder (cats mewing away), pushing a lime green suitcase (thank goodness I got the four wheel smooth rolling kind) with a large shoulder bag and a child’s elephant backpack looped over the handles, an umbrella stroller hung on one arm, and barking orders at a small child to “stay near mommy.” The picture of the consummate traveler I am sure. So I sat back to enjoy the next 14+ hours before we landed in Shanghai and the craziness would begin once again. C and the cats did pretty well on the flight. I did alright too. With only three hours of sleep on the flight (and only three and a half hours the night before the flight) I managed to once again get all of us and our stuff off the plane, through immigration and to the baggage claim. I must have been in an extremely good mood because after fighting our way through a massive bottleneck to get to the immigration lines and then waiting for 20 minutes in line, I took the immigration officer’s suggestion to use the diplomatic passport line next time quite well. I just smiled and shrugged and said ok. I could have broken down into wails of frustration. At baggage I stared in dismay at the tiny luggage carts and the four checked bags circling the conveyer belt. There was no way. Then the quarantine lady showed up and she helped me to collect, load, and push the luggage over to the quarantine officer where we registered the cats and paid the fee ($320 per cat, ouch). C insisted on opening one of the cages and petting the cat saying “easy, easy boy” which is clearly from an episode of one of her DVDs. Quarantine lady then also helped us to push the other cart back through customs and to arrival where thankfully my social sponsor was waiting. The next day, thanks to my sponsor’s wife, I had my first interview with a potential nanny and the following day my second interview. I hired the second nanny to start tomorrow, Monday. Whew. That is not how I wanted to go about it but it is what it is. So though I did not head into work the day after arrival as I had originally expected (and yeah, despite the 13 hour time difference and the some 22 hours of door to door travel time I had thought I would do that), I still sort of hit the ground running. Registration at the apartment complex. Check. Internet up and VPN working. Check. Nanny hired. Check. Signed up for gym membership. Check. Extra furniture removed from apartment. Three visits to the supermarket. Trip to IKEA. C signed up for Shanghai Centre Kid’s Club. Visit to nearby Jing’an Temple. Welcome lunch with friends. Blog post. Check, check, check…. Not bad for a jet lagged single mom with an arrival in China that had not gone according to plan.